In the Dirt: Who Wants to be the Yankees Skipper? Who Wants to be the Yankees Skipper? The New York Yankees started their search for a new manager yesterday when they interviewed former catcher Joe Girardi for the position. Today they will continue by interviewing Don Mattingly and finally Tony Pena will be interviewed on Wednesday. Once those interviews are done the Yankees are not likely to be finished. It was originally speculated that Tony LaRussa would interview for the job, but he has since returned to the St Louis Cardinals. Valentine managed the New York Mets to the 2000 World Series and currently manages the Chiba Lotte Marines in Japan. With Pena’s interview on Wednesday the Yankees will likely look at one or two more candidates. Former Yankee pitcher Dave Righetti, who is the current San Francisco Giants pitching coach, is another candidate according to the NY Daily News. 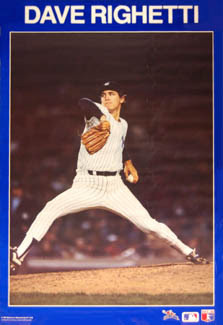 Righetti pitched with the Yankees from 1979 till 1990. He threw a no-hitter on July 4, 1983 against the Boston Red Sox. In 2000 he became the Giants pitching coach and has aspirations to manage someday. Another interesting candidate would be Boston Red Sox pitching coach John Farrell. With the Sox in the World Series this move is unlikely and the Yankees have yet to ask Boston for permission to talk with their coach about the position. That didn’t stop Red Sox manager Terry Francona from being a little suspicious, "He came in today to talk about what we're going to do tonight and I didn't want to talk to him," Francona said to the Daily News. "It would be sharing secrets." It still seems like Mattingly has the inside track. He was moved from hitting coach to bench coach this season in what seemed at the time as a step in the managerial direction. When the NY Post asked if there was a favorite Steinbrenner replied, “There's a slight favorite, not a heavy favorite.” Many are assuming that slight favorite is the former Yankee captain. Ream more NY sports at Hot Stove New York.